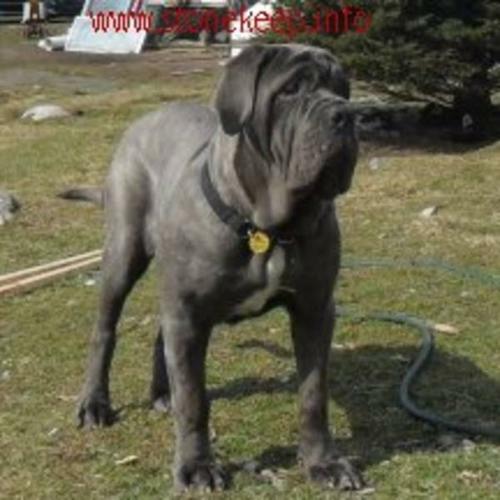 12 month old neapolitan mastiff puppy, 115 lbs already, going to be a monster. This pup has alot of type like great bone and balanced proportions so she was held back as possible breeder but due to some issues like a roacked back and some stiff movement in the rear she can't be used for that. Since we had her for a year and have grown attached to her I am just looking to place her in a great and qualified pet home where she will be spayed and have cherry eyes removed at the vet by new owners. Very submissive to family but leary with strangers. Not good with kids, as she hasn't really had much exposure to them. This breed needs an experienced owner. If you have not studied the breed please don't apply. It is not a breed for novice or the faint of heart. These dogs where bread in italy as worriors, gladiators and are NOT GENTLE GIANTS like the Celtic bread English mastiff. Our last English mastiff litter due end of oct.